The Go Sabah app was launched officially today at the World Islamic Travel Mart-Malaysian Association of Tour & Travel Agents Fair 2013 in Kuala Lumpur. The app, available for iOS and Android smartphones and tablets, has been online for the past couple of months and has so far clocked 1,000 downloads. A word of caution though, don’t confuse it with another app, the Turkish “Sabah” app or else you’d be left wondering why there was no reference about Borneo. Anyway, the app is about 8MB and once downloaded and installed, it stands out among your other apps with its cute Orang Utan icon. Tapping on the Orang Utan will open up the app’s interface (right picture, above) where you will be able to access general and specific information about getting around in Sabah, accommodation list, where to visit, travel ideas, places near you, year-round event listing, weather information as well as useful contact details such as Customs, Police, Sabah Tourism Board and so on. “The app offers quick information of tourism attractions, facilities and a global positioning system-enabled features that guide users to the nearest facility or outlet within a 2km radius,” the Sabah Tourism Board said in a statement. Overall, Go Sabah is a neat app. It has all the necessary information on visiting Sabah, the Malaysian Borneo. A giant Kudos for Sabah Tourism Board for developing the app. One feature that is missing though — a search function. Perhaps this can be added in future updates. Download Go Sabah app on Google Play and iTunes. CNN Travel describes Malaysian Borneo as a 20 vacations in one, and named Mount Kinabalu, Sipadan, Sepilok Orangutan Sanctuary, Kinabatangan River, Kuching Cat Museum and a number of other places as destinations that should give tourists a taste of what Borneo has to offer. Other in the list are places to experience rainforest and national parks as well as islands off Kota Kinabalu. There is a new discussion going on over at TripAdvisor regarding a question posted by tanewman of England. She says she only has seven nights to be spent in Borneo during which she wants to see orang utans, sea turtles, experience culture, relax and sunbath. So here is an itinerary which might fit this requirement. I would say there are three areas to visit to see all those — Kota Kinabalu, Kudat and Sandakan. Day 1 — Go to Bavanggazo in Kudat to see the Rungus Longhouse in Kampung Tinangol, about 140km from Kota Kinabalu or about two hours of driving away. Return to Kota Kinabalu in the afternoon. While in Kudat, why not go further north to the Tip of Borneo, about an hour away from Bavanggazo? Day 2 – Visit the Monsopiad Cultural Centre in Penampang. Located about 20km from Kota Kinabalu, the centre is named after the legendary headhunter Monsopiad. Here you will be able to see a glimpse of Sabah’s headhunting past… there is a skull house that houses these trophies. After the visit, fly to Sandakan in the afternoon. Day 3 – In Sandakan, visit the Sepilok Orang Utan Rehabilitation Centre, about 25km from the east coast town. It is the biggest such facility in the world. However, to make the trip fruitful, visitors need to be there during the feeding time at 10 am or 3 pm. After the feeding time, visitors will be able to watch a movie about the rehabilitation works done at the centre. This can be followed by a visit to the adjacent Rainforest Rediscovery Centre nearby. Day 4 — Still in Sandakan, visitors can proceed by boat to Langkayan Island or to Turtle Island see sea turtles and relax and sunbath. Day 5 – Still at Langkayan or Turtle Island – more relaxation and sunbathing. Day 6 — Take the 8.15am flight back to Kota Kinabalu (it’s a 40-minute flight), arriving by 9 am. At noon, proceed to one of the nearby islands at Tunku Abdul Rahman Park for more sunbathing and relaxing. Day 7 – Fly out of Sabah to via several direct flights available (source: Wikipedia) namely to Bandar Seri Begawan, Brunei on Royal Brunei Airlines; Angeles, Philippines (Clark) located 2 hours north of Manila on AirAsia, Hong Kong on Dragonair, Malaysia Airlines and AirAsia; Jakarta, Indonesia on AirAsia; Shenzhen, China on AirAsia; Manila, Philippines on Cebu Pacific Airlines and Malaysia Airlines; Seoul, Korea on Asiana Airlines, EastarJet, Jin Air, Korean Air and Malaysia Airlines; Singapore on AirAsia, Silkair; Taipei, Taiwan on Malaysia Airlines, AirAsia (Taoyuan), Mandarin Airlines (Songshan); Tarakan, Indonesia on MASWings; and Balikpapan, Indonesia on MASWings. So you are in Borneo after travelling half way — or quarter way — around the globe. What better way to commemorate your trip than to visiting the northern most of the world’s third largest island and take a postcard picture of yourself at The Tip of Borneo. The Tip of Borneo, located at Tanjung Simpang Mengayau, is about 180km or about three hours’ drive from Kota Kinabalu, the capital city of Sabah. In case you are wondering what to do at The Tip of Borneo other than being there, well, if you have plenty of time to kill, there are chalets available for you to spend the night by the beach. From here, you will be able to reach several attractions only seen in the northern part of Sabah, notable of which are the Rungus traditional longhouse located in Kampung Tinangol, about 30km away. How to reach The Tip of Borneo from the United States? Well, get on a flight which will either take you to Kuala Lumpur (KUL) or Singapore (SIN). From there, take a flight to Kota Kinabalu (BKI), rent a car, switch on your GPS and find Tanjung Simpang Mengayau. Planning to travel to Borneo soon? Here’s is an essential guide to travelling in Borneo, published by Lonely Planet. The time allocated to researching the book, according to a brief information posted on Amazon, was 110 days in-country, resulting in 50 detailed maps, 35 jungle adventures, national Parks colour section covers where to spot elephants, monkeys and the rafflesia flowers. It also features specialists discussing local markets, the best Malaysian cuisine, ecotourism and conservation. There is also a newer version titled Lonely Planet Borneo (Regional Guide) and is available for pre-order from Amazon. Borneo, the world’s third largest island, is divided among Malaysia, Indonesia and Brunei. I would like to think, however, that the best of Borneo can be found in the two Malaysian states of Sabah and Sarawak. If you have three weeks of backpacking in Borneo, where should you go? Where should you start? I guess you can start the tour from Kota Kinabalu, the capital city of the Malaysian state of Sabah. You can access Kota Kinabalu either from Malaysia’s KL International Airport or Singapore’s Changi Airport. Budget carrier AirAsia also flies to Kota Kinabalu from these two airports. Here are 14 things you can do in Borneo but first a brief disclaimer. This is neither a definitive nor a comprehensive guide as it only touches on tourist attractions in Sabah. Please check with Sabah Tourism or local tour agents for a more information. This blog has no business relations with tour agents mention in this entry. 1. Explore the city on your arrival, go to the museum, night market, Gaya Street Sunday bazaar or laze on the seafront. 2. Visit Monsopiad Cultural Village for a unique cultural experience. Located 20 minutes from Kota Kinabalu, the village is a traditional as well as a historical site maintained by the descendants of the feared and legendary Kadazan head-hunter warrior Monsopiad. His trophies of 42 skulls and a thigh bone are still kept at the village, in a hut called the House of Skulls. 3. Visit Tunku Abdul Rahman Park, about 15-20 minutes by speed boat ride. The park is a cluster of five islands — Pulau Gaya, Pulau Sapi, Pulau Manukan, Pulau Mamutik and Pulau Sulug. You can dive, snorkel and learn how to scuba dive there. You can also do seawalking in Pulau Sapi where you’d get to walk on the sea bed as though you are walking on land. 4. Climb Mt Kinabalu (requires 2 days minimum). Mt Kinabalu is Borneo and Malaysia’s highest mountain. The 4,092.5-metre mountain is used to be the highest mountain in Southeast Asia until someone pointed out that the Hkakabo Razi, at 5,881m in northern Myanmar or Burma, is the tallest mountain in the region. Myanmar is of course a Southeast Asian country. So we now say Mt Kinabalu is the highest mountain between the Himalayas and New Guinea. The mountain is the central piece of the Kinabalu National Park, a World Heritage Site, located about an hour’s drive from Kota Kinabalu. 5. Take a bath at Poring Hot Spring after the climb. The hot spring is located 40 minutes drive from the Kinabalu National Park. 6. Klias Proboscis Monkey Cruise , a 2-in-1 excursion, where you are taken on a boat along the Klias River (two hours drive from Kota Kinabalu) to see proboscis monkey and then as night sets in, treat yourself with spectacular display of nature’s own neon lights — thousands of fireflies lighting up trees by the river. More info here. 7. Visit the Sepilok Orang Utan Rehabilitation Centre. To many tourists, going here is among the main reasons — to some, the only reason — why they come to Borneo. Make sure you reach this centre by 9.45am in time for the orang utan feeding time at 10am. The orang utan are fed again at 3pm. Why must you come during feeding time? Because that’s the time you’d get to see these men of the forest emerging from their jungle habitat. There will be a video show after that and it is recommended that you go and watch it. It is enlightening, to me at least. More info here. 8. After seeing the orang utan, you can proceed to the Rainforest Rediscovery Centre not too far from Sepilok. It is dubbed as the most accessible rainforest in Sabah. More info here. 9. Visit Selingan Turtle Island and see marine life, turtles lying eggs and so on. You can also contribute to the conservation of this planet’s turtles by helping to release young turtles to the ocean. 10. Explore Sabah largest limestone and bird nests cave called Gomantung Cave. 11. Join Oxbow lake cruise for another wildlife excursion. For more information about what you can do in Sandakan, the available tour packages and so on, refer here. 12. Ah, time flies. It going into the third week already. If you are a diver, diving in Sipadan is a must. You haven’t seen anything yet if you haven’t dive in Sipadan. Maybe that’s an exaggeration and coming from a non-diver, you need not take my word for it. But you should really take Jacques Cousteau’s word seriously. 13. If you are not a diver, and want to see Sabah’s own version of the Amazon rainforest, you should really come to Danum Valley Conservation Area in Lahad Datu. There’s a jungle lodge there. It is an ancient jungle, minus T-Rex and co, of course. There is also an ancient burial ground which is not really a burial ground but rather a place where the dead in their timber coffin are stashed away in caves. 14. I guess, by now you have seen most of the major attractions Sabah has to offer. By now your three weeks is almost over. You can now return to Kota Kinabalu to catch your flight back. However, if you still have a day to spare, you can make a quick dash to the northern part of Sabah to the village of Tinangol where you can see the traditional longhouse community. That’s three weeks for you… and you still haven’t discovered the Malaysian state of Sarawak. Well, you can come back later for another three weeks of experiencing Borneo from Sarawak, the Land of the Hornbills. Lots of amazing things there… limestone landscape, people, world’s biggest cave and so on. To the people of Borneo, being in Borneo is being somewhere. To many people around the world though, Borneo is a complete middle-of-nowhere — a place you can get lost into. Which isn’t exactly a bad thing if travel to a remote location on the earth is what you have been looking for. The Single Minded Women website recently posted an entry suggesting “middle-of-nowhere” places where you can go. It lists Sepilok Orang Utan Rehabilitation Centre in Sandakan, Sabah, as one of the places. Proclaiming that nowhere is the new somewhere, writer Allison Neves also listed several other rewarding places to visit despite their remoteness, namely Mission Beach, Australia – The Sanctuary Yoga Retreat and Eco-Lodge; Osa Peninsula, Costa Rica – Lapa Rios Ecolodge; Amazon Basin, Peru – Cayman Lodge Amazonie; and Maputaland, South Africa – Rocktail Bay Lodge. This is not good. Instead of moving up, Sipadan Island is falling behind in the race for the New Seven Wonders of Nature. It is now ranked No 15 after moving up to number 14. Sipadan will have to climb up to No 11 to qualify for the next round of voting. Those who want to see Sipadan listed as the new Seven Wonders of Nature, will have until mid-July to put Sipadan in Number 11. Vote for the island by clicking on the widget on this blog’s sidebar. One vote for each email address. An email address is all you need to qualify to vote. There is still plenty of nature in Borneo notwithstanding reports of habitat loss due to logging and oil palm plantation. 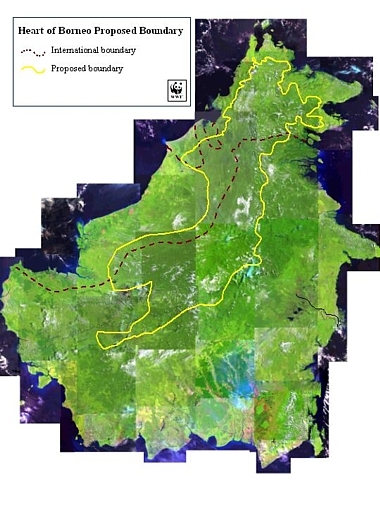 A vast portion of the world’s second largest Island (well… third, if you count Australia as an island) will remain protected and covered in pristine jungle if the initiative to conserve the area known as the Heart of Borneo succeeds. This is where you will be if you choose to take the brand new six-star luxury river cruise on the Rajang River — Malaysia’s longest river — starting July this year. The cruise is called “Into the Heart of Borneo”, based on the title of a book by Redmon O’Hanlon. O’Hanlon will be among 60 passengers on the cruise’s maiden voyage using a replica of an American paddle steamer, which will set sail from the town of Sibu on July 9. It will sail up to the Baleh River, a tributory to the Rajang River, which recently shot to worldwide fame following the release of two pictures, purportedly those of the Borneo giant snake, the 100-feet Nabau. The pictures show a serpentine figure swimming in the river. The photos later turned out to be a hoax. Good thing… now we can cruise in peace. The cruise, onboard the RV Orient Pandaw, is operated by Southeast Asia’s biggest cruise operator Irrawaddy Flotilla Company which has carved a name for itself in specialised river cruise excursion under its Pandaw cruise brand. The New Straits Times newspaper quoted Sarawak Tourism Board chief executive officer Gracie Geikie as describing the cruise as the first of its kind in Malaysia. “There’ll be stops along the river to enable the passengers to go hiking and visit longhouses and towns,” she said. There will also be a stopover at Kampung Rajang, near Tanjung Manis at the river mouth, for a visit to the songket factory. Another stop is Sarikei to visit a pineapple farm, for which the town is famous. Passengers can also choose to shoot the Pelagus rapids, the New Straits Times said. After the Pelagus rapids, the cruise heads upstream Rajang’s main tributary, the Baleh River. The area along river is populated by the Ibans who were headhunters until in the 1950s.